Rikudo of Buddhism is an idea based on the transmigration of the soul, it’s six worlds in which dead person is reborn next. These worlds are considered as parallel exist. Essential teachings of Buddhism are “to live is to experience many sufferings”. I mean, “Not to rebirth after death” is the most happiest thing. It’s called GEDATSU, it means “leave from the transmigration of the soul”. Because only “No rebirth” can avoid from sufferings. Ten-do, Ningen-do, Shura-do, Chikusho-do, Gaki-do and Jigoku-do. Dead person is put on trial by Enma Daioh. 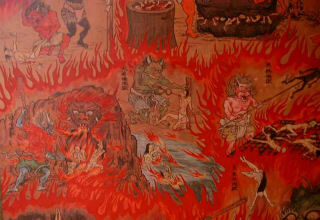 He indicates to let dead person go to one of six worlds based on past actions, or Gedatsu. is fortunate world that sufferings are smaller than human being. Ningen means human being. That is Ningen-do is the world of human being. There is many sufferings in this world, but sometimes they can feel happy. is the world of endless conflict, struggle, quarrel. And here are many sufferings and rage. But all causes are due to oneself. That’s why they suffer more. is the world of starvation and thirst. If they ate something, they would be in flames. It’s said that the world that a person who didn’t feel for others goes to. is the world that an evil persons goes to. That is to say, it’s the hell. The first of all, for the purpose that it doesn’t make them retort, Enma Daioh removes their tongue. And they are sent to the hell. They can’t speak words, all they can do is screaming. There are ONI who are a horrible watch of the hell. 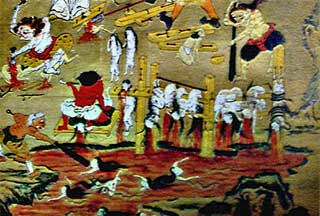 Evil persons have to accept severe punishment from ONI. For example, swimming at blood sea, climbing to needle mountain, sleeping on hot plate, dragging by car and so on. They need to endure a long long time. At last Enma Daioh permits them to be reborn. About words from the transmigration of the soul.